Boisterous Irish lot Fight Like Apes are pretty much my favourite live band. And they're more than decent on record too - their debut 'Fight Like Apes And The Mystery Of The Golden Medallion' being a particularly bouncy delight. They're upto album number three now and here's a taster, accompanying a crowdfunding campaign to help finish and market it. The band are looking to raise €20,000 and with three or so days to go (at the time of writing), they're only about €4,000 short. Which is good going. There's the typical gamut of rewards for your funding, from the bog standard finished CD album to your very own Fight Like Apes gig. Speaking of which, the band are heading out on a UK tour shortly, and as previously explained - well worth seeing. As for 'Pretty Keen On Centerfolds', I'm pretty keen on it and the demo brings the usual Fight Like Apes verve of synth-pop and quirky lyricism. 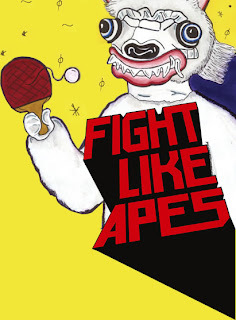 You can get another taste of some Fight Like Apes goodness from the video below, although the track apparently won't be appearing on the album - hopefully it will appear on a preceding EP, which I've heard will be released on the excellent Alcopop label.